I enjoy the taste of bourbon, but am not so snooty that I don't enjoy sweet mixed drinks from time to time - and even liqueurs. Early on in this blog I gave Jim Beam's cherry flavored bourbon liqueur Red Stag four stars because I felt that the sweetness augmented, rather than obscured the taste of the bourbon - a rarity among whiskey liqueurs in my experience. Tonight's tastings underscore that conclusion. Both items are "honey" adulterations. Honeys are the new rage - perhaps a descendent of the beloved toddy. Every brand seems to have one out. The idea is pretty simple. Bourbon is often sweet with corn sugars and tree sugars from the oak wood - giving a toffee or caramel or brown sugar flavor profile. The addition of honey amps this up and harmonizes and produces a whiskey that, in theory, is sweet and satisfying and mixes well into a variety of beverages. Theory has a tough time living up to reality - especially when you're talking about messing with America's national beverage. Nose: honey, brown sugar, treacle, nutmeg. Rather nice in a heavy handed dessert kind of way. Entry is syrupy and thick and moderately sweet. Midpalate expansion is soft and gentle with honey, spirit heat that gives a medicinal feel, and the soft candy corn meets licorice and wood notes of Jack. The Tennessee light charcoal and honey corn flavor swell with a big sweet honey and mint midpalate bloom. There is a bitter note in the finish - but it's almost welcome after all the sweetness. This is almost good enough to drink neat - but not quite. In coke and sprite it's ok - but its gentle nature makes it get lost a bit in the mix. This is the most successful of the "honey" bourbon adulterations in my experience so far (see my earlier pan of Wild Turkey American Honey). You can actually taste the bourbon and you can really taste honey here. However it still isn't quite good enough to recommend. Close - actually very close - but the texture is too thick and the medicinal note combines to read a bit like cough syrup. What works is the honey flavor. If only the bourbon flavor were a little richer and the texture a little thinner. Nose Jim Beam bourbon, lemon, and simple syrup. Entry is syrup thick and sweet. Expansion has that good Jim Beam bourbon flavor but is dominated by a bright but not fruity lemon note, a medicinal spirit heat, honey and some vague sense of tea. In the turn the classic beam sour barn flavor signature shows, among fake melon notes, some tannin that might be from wood, or from the hint of tea. This is a mess. The syrup thickness and excessive sweetness is cloying, and the tea traces seem out of place and lost in action. The finish is loaded with ersatz flavor notes. I don't buy the tea flavor or the honey flavor here. Only the bourbon flavor is good - and it's not good enough to correct the sins. 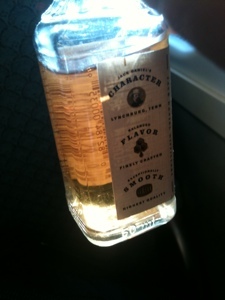 This works better in Ginger Ale or Sprite (but only just OK there), but it's not drinkable neat. 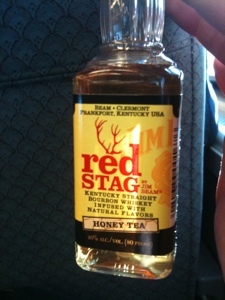 After the success of the regular cherry Red Stag I was expecting better. This experience doesn't give me much hope for the Spiced expression either - but I'll try to have an open mind. a quarter cup more or less of boiling, or very hot, water - to taste. Lots of folks use a whole cup. You can get fancy with a cinnamon stick if you want, and a twist of lemon, if you must. Dissolve the honey in the water and mix in the bourbon. Consume warm. I have yet to try any of these. If they are anything like The Knot (talk about dreadful! ), then I will steer clear of them. Interestingly enough, I like Drambuie and have a bottle that I received as a Christmas gift a couple years ago. On second thought, that bottle of Drambuie hasn't been opened in quite awhile, so perhaps I don't like it as much as I think. I like your Hot Toddy recipe much better! A bit too much effort, but I'm sure it tastes wonderful. I'm ok with liqueurs on occasion (i.e. after dinner). They're not my drink of choice, but have had a few that I enjoy (Amaretto, Tuaca, Limoncello, etc). If I'm not having an after dinner whisk(e)y, then I would typically go for a bitter like Averna, Fernet Branca, or Cynar. Must be my Sicilian roots showing. 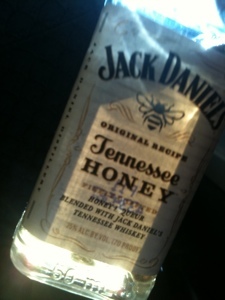 JD Honey for me just lacked that kick and robustness from no 7 for me.And yes its a bit thick. How can USA produce all these honey whiskies when apparently there was a bee shortage? This Tam's Ginger Honey Islay Liqueur gets good reviews. They say it has power and it's 47%.